i'm not much of a poser-fan i have to admit. but this one really has it all, great details in the texture and good lighting. well done! Excelant color arangement, love the detail! Awsume work! o_O This is one of the best 3D renders I've ever seen. Wow. 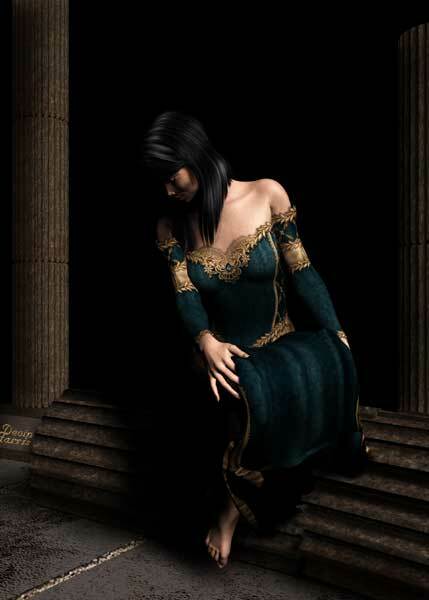 Details on her dress and texturing of the floor and pillars are absolutely stunning. The atmosphere achieved through light and darkness is great. Fantastic work! Her gown is gorgeous and I really like her pose. Her darkened face does convey a sadness that loss can bring.